My daughter is big into Lego Friends (or really any building sets!) this year. And a lot of them are not cheap. Here is an awesome freebie you can grab for the Lego Lovers that will continue all year long! Grab a 2 year free subscription to Lego Club Magazine. You'll have to sign them up for the Lego Club website and after confirming the email you'll receive another email for the magazine. 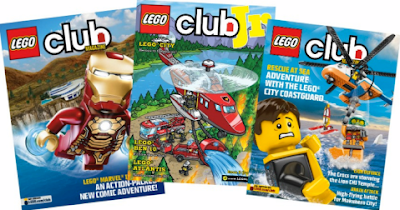 The magazine is aimed at kids 7+ but don't worry if your little one is younger because they will be subscribed to the Lego Club Jr. Magazine. Click on the picture below to get this great freebie!